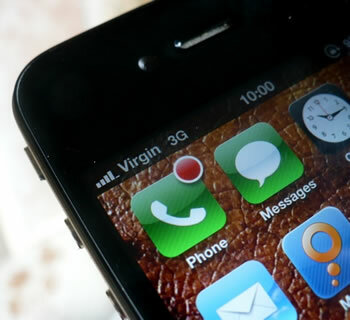 Virgin Mobile has revealed that it will be the second US carrier to offer prepaid iPhones starting June 29. The news follows about one week after an announcement by Cricket Wireless, which will sell prepaid iPhones starting June 22. Both providers will sell Apple's handset contract-free for a hefty sum upfront while offering significant savings over the course of a couple years, though they take slightly different approaches. In case you missed the previous post, Cricket will offer the iPhone 4 8GB for $400 and 4S 16GB for $500 (both are $150 less than full retail) with service at $55 a month for unlimited voice, text and data (throttled beyond 2.3GB). Virgin will sell the handsets unsubsidized ($550 and $650) but provides more flexible plans starting as low as $30 per month, which could produce additional savings in the long run. The $30 option supplies 300 minutes, unlimited texting and unlimited data with a higher soft cap (2.5GB instead of 2.3GB). The next costs $40 a month and increases voice to 1,200 minutes, while the third is $50 for unlimited voice. Assuming you buy the pricier iPhone and you can get by with 300 minutes, you're looking at as little as $1,370 over two years, versus beyond $2,000 for a contract with AT&T, Verizon or Sprint. Virgin's $40 plan seems to be the best value for heavier users. Although it doesn't have unlimited voice, 1,200 minutes should be plenty for most people. With the 4S 16GB at $40 a month, you'd pay $1,610 over two years versus $1,820 with Cricket and again, more than $2,000 via contract. It's worth noting that Virgin Mobile USA is owned by Sprint and uses its network, so you're essentially getting the same service at a bargain.